No feedback required about these shapes (postive or negative). But wouldn't you want look at doing some actual math? Much like Junes shapes. I know passing values between shapes in Visio is tough...but it would make these shapes "killer shapes"
I wonder however what you would like to get automated? A real control simulation would probably be too difficult to program. Isn't it. You may want to talk June, I think he did something like this a few years ago. Haven't checked the video yet...but, the math in a control system is not simple, if you're going to do an actual modelling...LaPlace / Fourier transforms, sampling, etc. Visio makes a nice documentation tool, but it is not an analytical tool. If just numbers were involved it might be possible, but the formulae used are normally very complex. I'm not sure even Excel could handle the calculations. It's more the domain of mathematical modeling software. For what it's worth...Excel can analyze the math. It took about a year, part time, to develop, but I was able to create an Excel PLL analysis program back in the 90's, of course. It was limited to 2nd order, type 3 systems as I recall. Definitely an involved task. Agree with Paul. Tagging will be the least of the problems. The simulation - the really interesting part - is the real issue. 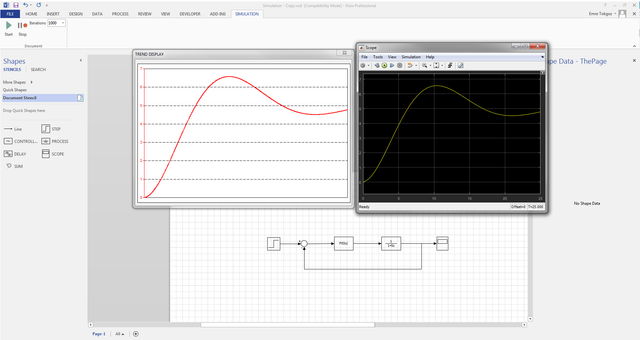 I've been playing with open modelica for the last 5 years or so. Starting and stopping after some months, again and again. The models I handle (Custom made confectionery lines) are so complex and involve so many disciplines, that I cannot really elaborate by myself a working solution. Modelica has - unlike Visio - such a small community, that you cannot get useful (fast) help. Getting a budget for professional help has - this far - been beyond my engagement. So I kept trying and failing by myself again and again. The solution Vojo suggests would (could) involve modelling the system in Visio, send it to Modelica and get back the results. A connection to Visio - altough it existed in the early days of openmodelica - is badly documented (actually "impossible"). The issue is, Modelica (or better its implementations as openmodelica, simulationX, ...) have their own visualisation tools and therefore would not require Visio. My (preliminary) conclusion for the subject would be: If someone uses Visio for control loops, then it will always be for a "dumb" visualisation. The intelligence being in a textual explanation. Intelligent systems will bring their own visualisation. Problem is the execution speed. I set the speed to "40 iteration/second" which takes 25 seconds for 1000 iteration whereas it takes smaller than a second in Matlab. I will post the sample visio file with necessary references tomorrow if someone wants to try.